Search Results for "autumn lawn"
Autumn crocus blooming in lawn. Colchicum autumnale, autumn crocus, meadow saffron or naked lady blooms in autumn with no surrounding leaves. The leaves and seeds appear in spring. Small child considers yellow leaves on green lawn in autumn park. beautiful baby iraet on lawn and learns world. Curious beautiful puppy pokes his face into camera lens. Mistress walks her dog on leash in Park in autumn on lawn. Mom plays with baby with dry yellow leaves on lawn in autumn park. child is sitting on grass, mom picks up child from lawn. Happy young women are doing pair yoga having fun and laughing sitting on mats on grass in park. Beautiful autumn nature lawn and trees are in background. Autumn landscape with trees and lawn in the foreground. The autumn forest. Renova. Russian innovations center Skolkovo, slow taking off and circling over the lawn. Autumn, daylight. small child runs in autumn park on lawn and dry grass. Happy little baby walking in evening on street. 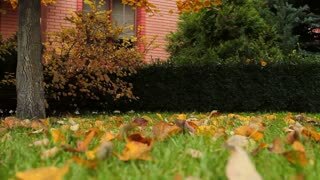 Raking autumn leaves from lawn.